The area’s No. 1 ranked heavyweight Jacob Padilla (left) returns to anchor the Wayne wrestling team. James Wilson won by a fall in 30 seconds against Wayne’s Jannick Huss. Bryan Heyward gains the upper hand vs. Seth Spidell in one of the heavyweight matches. Jaden Hardrick (left) scored a 6-0 decision over Phil Tracey to give Wayne a victory in the final bout of the night. 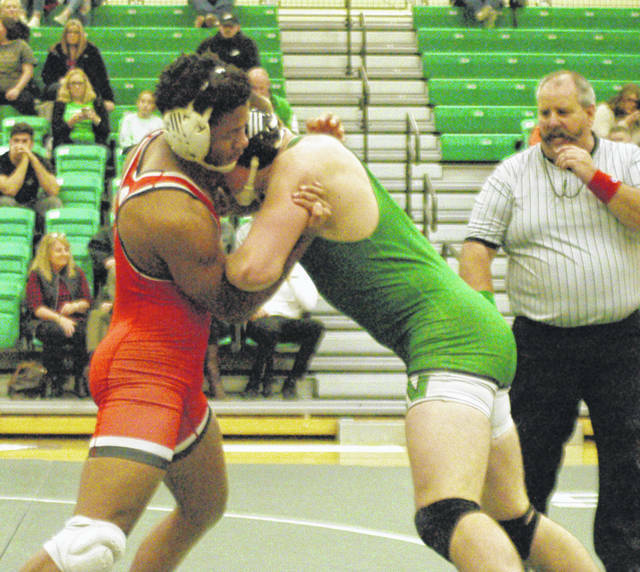 Tyler Stevens tries to shake Northmont wrestler Phil Tracey off his back. 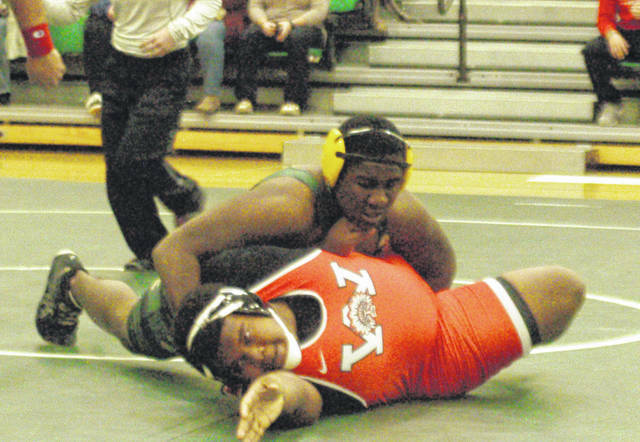 CLAYTON — In some respects Northmont and Wayne are facing new issues with their wrestling teams, but not in the same areas. 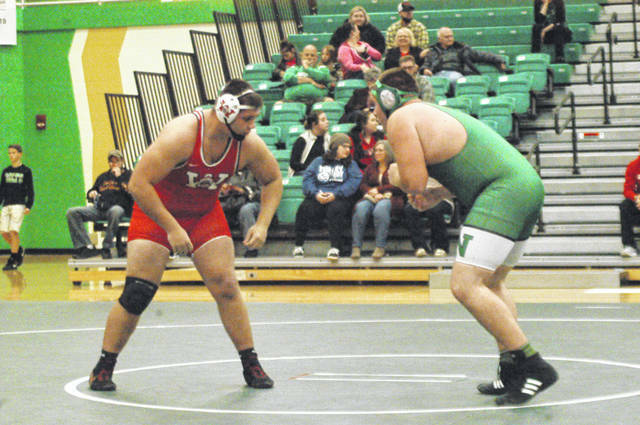 Friday night Northmont hosted Wayne for the Thunderbolts annual Wrestling Premier with Wayne as the repeating guest team. For the first time in years the Warriors have enough athletes to field a full varsity squad and will also have a JV team, and that hasn’t happened in a long time. However, most of Wayne’s wrestlers are inexperienced. On the other hand Northmont has a decent core of returners, but the Thunderbolts have no wrestlers in the lower weight classes – nothing below 135 pounds. It is also the smallest team Northmont has ever fielded number wise. Wayne has plenty in the lower weight classes including three 106 pounders. Backing up Padilla in the heavyweight class is Seth Spidell, who along with Padilla played on the Warriors varsity football team. 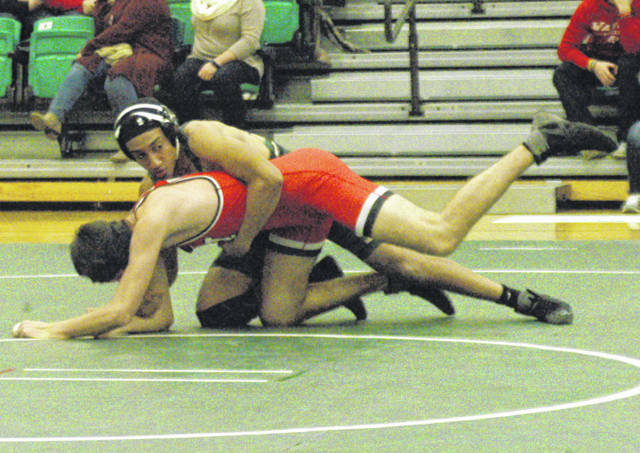 Wayne took its lumps Friday as Northmont won the first eight matches, six by pin. Andrew Knick won by a fall (pin) in 41 seconds vs. Mason Lawson. Mason Sigler won by a fall in 34 seconds against Brian Shaw. James Wilson won by a fall in 30 seconds vs. Jannick Huss. Billy Mengerink won by a fall in 1:25 vs. Karam Abuhelia. Phil Tracey won a 7-6 decision against Tyler Stevens and Bryan Heyward won a 7-2 decision vs. Seth Spidell. Miles Moyer won by a fall in 1:35 vs. Ozzan Makhmudov. Wayne picked up its first victory when Padilla won by a fall in 1:57 vs. Seth Frantz. Mason Lawson gave the Warriors back-to-back victories by scoring a 2-1 decision over Mason Sigler. The Thunderbolts got back in the win column when Jackson Clark scored a 6-3 decision over Brendan Dunn. Brian Jones won by a fall in 49 seconds against Spidell. Wayne’s Demetrius McFadden won by a fall in 2:37 vs. Mengerink. Noah Williams got his second win of the night with a pin in 47 seconds over Jannick Huss and in the final match Jaden Hardrick scored a 6-0 decision over Northmont’s Phil Tracey. Despite Northmont’s 57-18 match victory the Thunderbolts are facing some issues that will force them to forfeit at least 18 points in each match. But the Thunderbolts have four or five kids that have wrestled for three or four years at the varsity level and Newburg is looking for them to pick it up a notch to carry the team until his younger wrestlers gain more experience. 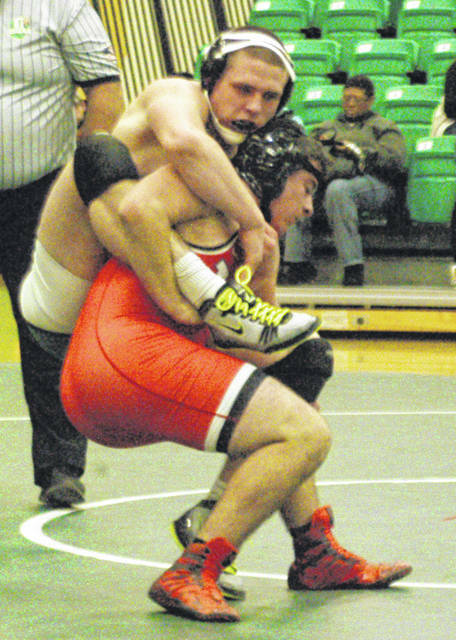 “I am pleased with how our younger kids are wrestling,” Newburg added. He went on to point out the paradox the team is facing this year. Wayne’s performance was hindered by not having several key team members in action for the premier match, and Bitsko stressed that what happened on the mat Friday was not indicative of how his team will compete this year.